Al Hinai FI, Al Hinai SS. Prospective Study on Prevalence and Risk Factors of Postpartum Depression in Al-Dakhliya Governorate in Oman. Oman Med J 2014 May; 29(3):198-202. The Sultanate of Oman is a multiethnic society on the southeast of the Arabian Peninsula with more than half of the population being Arabs.14 Females contribute to more than 40% of the population in all of the mental health services in the country.15 It is anticipated that this study will shed light on one of the major health problems. The findings of this study will help to fill in the gaps in the literature about PND in Oman. It will also help the decision-makers to ensure better planning, resource allocation and delivery of relevant health services. The study participants were Arabic-speaking Omani women who gave birth to a normal healthy child and attended the postnatal clinic and child vaccination clinic of the primary healthcare facilities (PHCF) at two and eight weeks post-delivery. Illiterate mothers were helped by trained nurses at each PHCF. Mothers who gave birth to baby with congenital diseases and malformations or who are known to have depression and on treatment or on follow-up in a psychiatric clinic were excluded from the study. All the volunteered mothers gave their informed consent. An Arabic version of the Edinburgh postnatal depression scale (EPDS) was used to assess the depression symptoms. EPDS is the most widely used and culturally validated instrument.17 It is a self-administered questionnaire and consists of 10 questions on the mother’s feelings over the last seven days. EPDS scores of more than 12 were the optimum cut-off scores for probable depression as validated in Arabic-speaking cultures.18,19 In order to fully describe the studied sample, scores of 0-9 indicates no risk of experiencing symptoms of PND, scores of 10-12 indicates minor/major risk of experiencing symptoms of PND (possible depression), and scores of 13 or above indicates a major risk of experiencing symptoms of PND (probable depression). All data analysis was conducted using SPSS (20.0). Multiple imputations were used to treat the missing data. 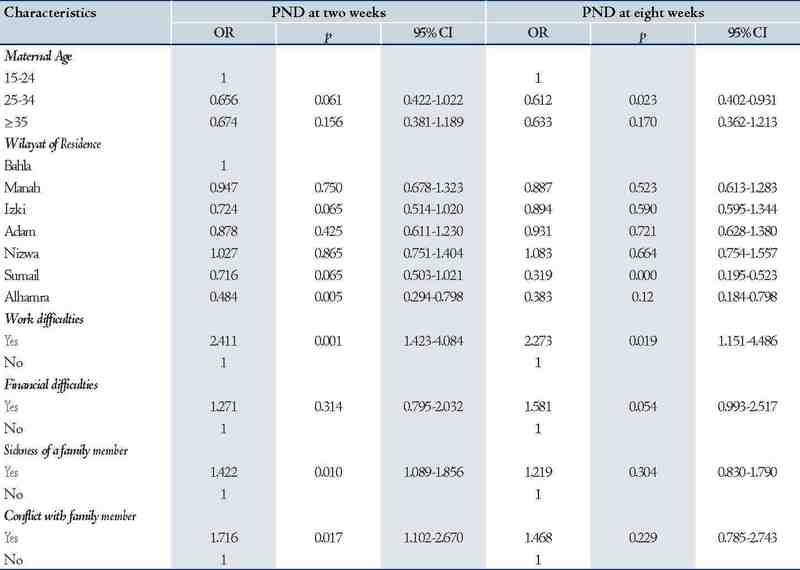 A negative binomial regression model was used to identify the association of the outcome (EPDS scores) at two weeks and eight weeks, as well as each variable. The adjusted odds ratio (OR) and the 95% confidence interval (95% CI) were reported, and a p value of 0.05 was considered statistically significant. A total of 282 women were recruited into the study from the seven districts in the Al-Dakhliya governorate. EPDS had a Cronbach’s alpha of 0.81. The mean age was 29.2 years (SD=5.6), ranging from 16 to 47 years. More than half (55%) of the mothers had completed either elementary or secondary level of education, 18% had achieved higher education (college or university), and only 3% were illiterate. The majority of the mothers were housewives (64%), and 66% of the mothers fall under the category of middle income family (500-1000 OMR per month). The study was comprised of 17% first-time mothers, and the highest number of pregnancies per mother was 13. Few of the mothers reported that their pregnancies were unplanned pregnancies (9%). Regarding the course of the pregnancy, the majority of the mothers reported no complications during pregnancy (61%). Around 64% had vaginal delivery and 14% had cesarean section. Table 1: Percentage of mothers with depression scores. 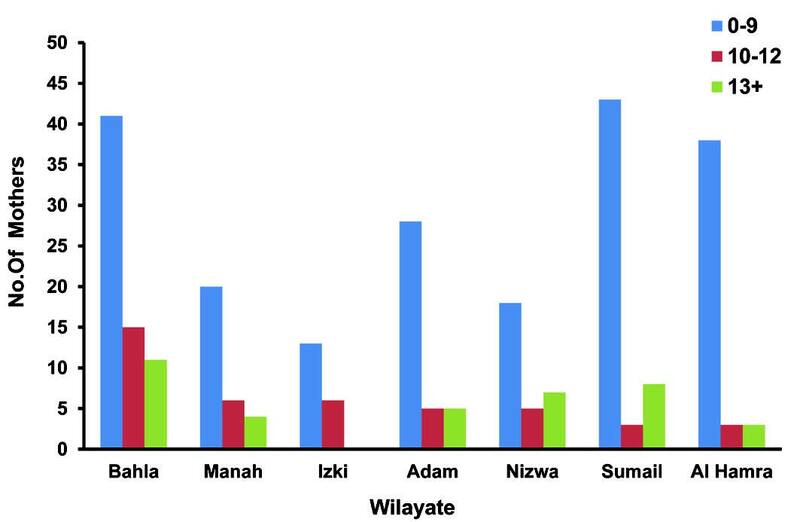 Figure 1: Distribution of EPDS scores at two weeks postpartum across Al-Dakhliya. 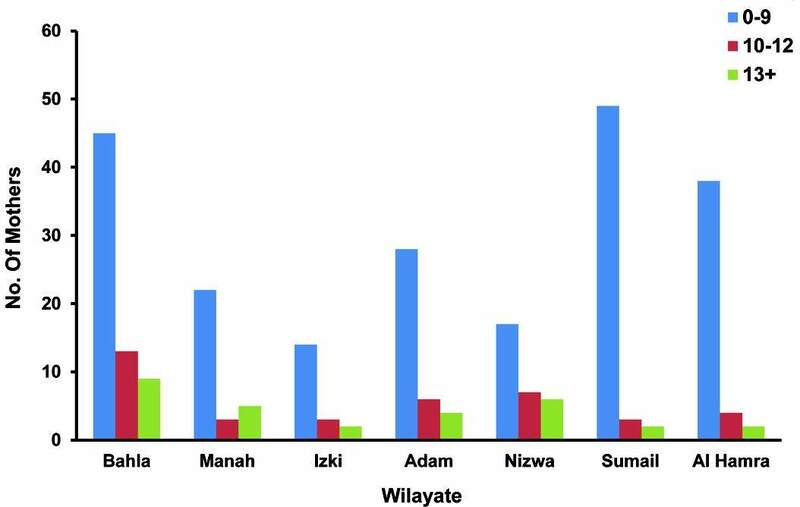 Figure 2: Distribution of EPDS scores at eight weeks postpartum across Al-Dakhliya districts. Mothers aged 25 years or more were less likely to have high EPDS compared to mothers aged less than 25 years at two and eight weeks postpartum. Sickness of a family member (n=39, p=0.010, 95% CI: 1.089-1.856) and conflict with a family member (n=15, OR=1.7, 95% CI: 1.102-2.670) were significantly associated with high EPDS scores at two weeks. Work difficulties were significantly associated with high EPDS scores at two weeks (OR= 2.4, 95% CI: 1.423-4.084) and eight weeks (OR= 2.3, 95% CI: 1.151-4.486). Other stressful life events (such as marital problems, gender satisfaction, car accident and death of a family member) were not risk factors. Socio-demographic factors, maternal medical factors and obstetric factors were also not found to be risk factors at both two weeks and eight weeks postpartum. Table 2: Negative binomial regression analysis of EPDS scores. This could be attributed to the empowerment of Omani women and the great support they receive from the government in education, job opportunities, civil service and social insurance. Recent studies conducted on Omani students reported that being a female is not a risk factor for depression.23,24 In addition, mothers receive support during the first 40 days from their families and possibly housemaids which helps to reduce the stress of being a new mother. Conflict with a family member increased the risk of high EPDS scores (OR=1.7). Mother-in-law interference in childcare and women usually do not get support when complaining to their husbands about the hostility of their mothers.28 The positive association between EPDS scores and sickness of a family member (p=0.010) is attributed to the increased responsibilities of the mother towards her family which increases stress. It is interesting to find no significant association between obstetric factors (number of pregnancies, planned pregnancy and mode of delivery) and EPDS scores, as this undermines the hypothesis of a hormonal effect on mood disorder. The main limitation of this study is the use of an un-validated version of EPDS. The inclusion of the participants from the health facilities induces a risk of bias. Mothers who have a lot of responsibilities and are under a lot of stress might not be willing to participate in any research. Moreover, the assessment of risk factors associated with PND did not include all of the possible predictors (such as prenatal depression, perinatal anxiety, breast feeding, self-esteem, lack of social support and difficult child-temperament). This study is among the few studies looking at PND in the Middle East and shows on average 12% of Omani women are at a high risk of developing PND (EPDS scores of ≥13). It is the negative and long term consequences of PND that necessitates early detection and management of mothers at risk. Validated version of EPDS can be used as a screening tool for PND along with clinical diagnosis. 1. Fisher J, Cabral de Mello M, Patel V, Rahman A, Tran T, Holton S, et al. Prevalence and determinants of common perinatal mental disorders in women in low- and lower-middle-income countries: a systematic review. Bull World Health Organ 2012 Feb;90(2):139G-149G. 2. Scottish Intercollegiate Guidelines Network (SIGN). (2012) Management of perinatal mood disorders [Online] Edinburgh: SIGN. Available from: http://www.sign.ac.uk/guidelines/fulltext/127/index.html (Accessed 1 May 2012). 3. WHO. (1993) International Statistical Classification of Diseases and Related Health Problems (10th ed.) The ICD-10 Classification of mental and behavioral disorders: Diagnostic criteria for research. Geneva: WHO, pp. 94-146. 4. Stewart DE, Robertson E, Dennis CL, Grace SL, Wallington T. (2003) Postpartum depression: literature review of risk factors and interventions [Online] Geneva: WHO. Available from: http://www.who.int/mental_health/prevention/suicide/lit_review_postpartum_depression.pdf (Accessed: 1 May 2012). 5. Goodman JH. Postpartum depression beyond the early postpartum period. J Obstet Gynecol Neonatal Nurs 2004 Jul-Aug;33(4):410-420. 6. Pignone MP, Gaynes BN, Rushton JL, Burchell CM, Orleans CT, Mulrow CD, et al. Screening for depression in adults: a summary of the evidence for the U.S. Preventive Services Task Force. Ann Intern Med 2002 May;136(10):765-776. 7. Buist A, Ellwood D, Brooks J, Milgrom J, Hayes BA, Sved-Williams A, et al. National program for depression associated with childbirth: the Australian experience. Best Pract Res Clin Obstet Gynaecol 2007 Apr;21(2):193-206. 8. National Institute for Health and Clinical Excellence [NICE]. (2004) Depression: Management of depression in primary and secondary care [Online] National Institute for Health and Clinical Excellence. Available from: http://www.nice.org.uk/nicemedia/live/12329/45890/45890.pdf (Accessed: 6 June 2012). 9. Chaaya M, Campbell OM, El Kak F, Shaar D, Harb H, Kaddour A. Postpartum depression: prevalence and determinants in Lebanon. Arch Womens Ment Health 2002 Oct;5(2):65-72. 10. Katherine G, Broome H, Mirabella J. (2006) Postnatal depression among mothers in the United Arab Emirates: socio-cultural and physical factors. http://ipac.kacst.edu.sa/eDoc/2007/162877_1.pdf edn. Taylor & Francis. 11. Masmoudi J, Tabelsi S, Charfeddine F, Ben Ayed B, Guermazzi M, Jaoua A. [Study of the prevalence of postpartum depression among 213 Tunisian parturients]. Gynecol Obstet Fertil 2008 Jul-Aug;36(7-8):782-787. 12. Mohammad KI, Gamble J, Creedy DK. Prevalence and factors associated with the development of antenatal and postnatal depression among Jordanian women. Midwifery 2011 Dec;27(6):e238-e245. 14. Islam MM. The practice of consanguineous marriage in Oman: prevalence, trends and determinants. J Biosoc Sci 2012 Sep;44(5):571-594. 15. Oman Ministry of Health. (2008) WHO-AIMS Report on mental health in Oman [Online] WHO. Available from: http://www.who.int/mental_health/who_aims_oman_report.pdf (Accessed: 7 May 2012). 16. Oman Ministry of Health. (2010) Annual health report 2010 [Online] Muscat: Ministry of Health. Available from: http://www.moh.gov.om/en/stat/2010/index_eng.htm (Accessed: 3 May 2012). 17. Gibson J, McKenzie-McHarg K, Shakespeare J, Price J, Gray R. A systematic review of studies validating the Edinburgh Postnatal Depression Scale in antepartum and postpartum women. Acta Psychiatr Scand 2009 May;119(5):350-364. 18. Agoub M, Moussaoui D, Battas O. Prevalence of postpartum depression in a Moroccan sample. Arch Womens Ment Health 2005 May;8(1):37-43. 19. Ghubash R, Abou-Saleh MT. Postpartum psychiatric illness in Arab culture: prevalence and psychosocial correlates. Br J Psychiatry 1997 Jul;171(1):65-68. 20. Cox J, Holden J. 2003 Perinatal mental health: a guide to the Edinburgh Postnatal Depression Scale (EPDS). London: Royal College of Psychiatrists, pp.125. 21. Dennis CL. Can we identify mothers at risk for postpartum depression in the immediate postpartum period using the Edinburgh Postnatal Depression Scale? J Affect Disord 2004 Feb;78(2):163-169. 22. O'Hara MW, Swain AM. Rates and risk of postpartum depression--a meta-analysis'. Int Rev Psychiatry 1996 Mar;8(1):37-54 . 23. Afifi M, Al Riyami A, Morsi M, Al Kharusil H. Depressive symptoms among high school adolescents in Oman. East Mediterr Health J 2006;12(Suppl 2):S126-S137. 25. Reid V, Meadows-Oliver M. Postpartum depression in adolescent mothers: an integrative review of the literature. J Pediatr Health Care 2007 Sep-Oct;21(5):289-298. 26. Corwin EJ, Kohen R, Jarrett M, Stafford B. The heritability of postpartum depression. Biol Res Nurs 2010 Jul;12(1):73-83. 27. Rao TS, Prabhakar AK, Jagannatha Rao KS, Sambamurthy K, Asha MR, Ram D, et al. Relationship between consanguinity and depression in a south Indian population. Indian J Psychiatry 2009 Jan;51(1):50-52. 28. Chan SW, Levy V, Chung TK, Lee D. A qualitative study of the experiences of a group of Hong Kong Chinese women diagnosed with postnatal depression. J Adv Nurs 2002 Sep;39(6):571-579. 29. Dagher RK, McGovern PM, Alexander BH, Dowd BE, Ukestad LK, McCaffrey DJ. The psychosocial work environment and maternal postpartum depression. Int J Behav Med 2009;16(4):339-346. 30. Eickelman C. (2002) Oil, Fertility, and Women's Status in Oman. In: Bowen D., & Early E. (ed). Everyday life in the Muslim Middle East. Bloomington: Indiana University Press, pp. 128-135. 31. Ho-Yen SD, Bondevik GT, Eberhard-Gran M, Bjorvatn B. Factors associated with depressive symptoms among postnatal women in Nepal. Acta Obstet Gynecol Scand 2007;86(3):291-297. 32. Rahman A, Creed F. Outcome of prenatal depression and risk factors associated with persistence in the first postnatal year: Prospective study from Rawalpindi, Pakistan, Journal of affective disorders, 2007 June; 100(1-3):115-121, Web of science [Online]. DOI: 10.1016/j.jad.2006.10.004 (Accessed: 1 June 2012).